Representatives of Spain’s La Liga and the Nigeria Professional Football League (NPFL) conducted a deal on Monday to improve sporting, cultural and business links between the two nations. The League Management Company (LMC), which organises Nigeria’s top football leagues, had previously visited Madrid from February 29 to March 1 to consolidate talks which had begun at the World Leagues Forum meeting in London in 2015. 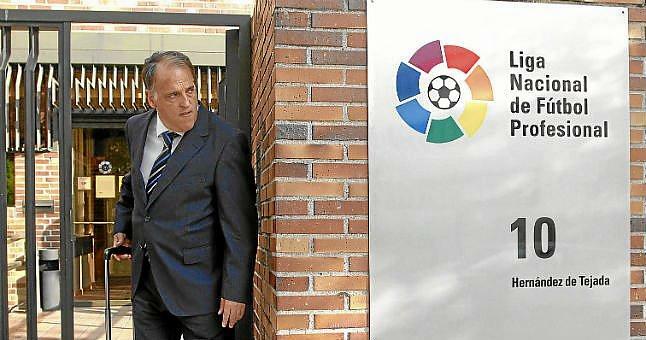 La Liga’s president, Javier Tebas, (pictured,)arrived in Nigeria on Monday for final talks, negotiating with senior members of the NPFL, including President Amaju Pinnick and LMC Chairman, Mallam Shehu Dikko. The partnership between La Liga and the NPFL will see a boost in commerce in the Nigerian leagues, which will have a positive impact on the welfare of players.Additionally, the partnership will aid trade links between the two countries, with Spain the third biggest buyer of Nigeria’s crude oil.